What if you make the maintenance of your Product Backlog a collective effort? Scrum is intended as a simple, yet sufficient framework for complex product delivery. Scrum is not a one-size-fits-all solution, a silver bullet or a complete methodology. Instead, Scrum provides the minimal boundaries within which teams can self-organize to solve complex problems with an empirical approach. This simplicity is its greatest strength, but also the source of many misinterpretations and myths. In this series of posts we — your ‘Mythbusters’ Christiaan Verwijs & Barry Overeem — will address common myths and misunderstandings. PS: The great visuals are by Thea Schukken. Check out the previous episodes here. 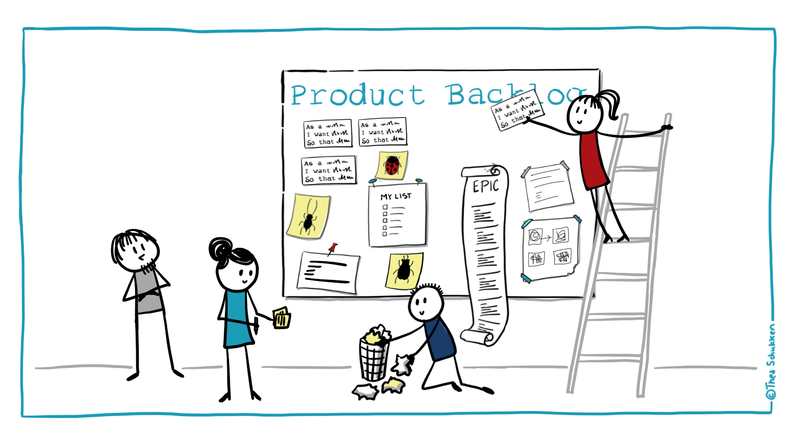 Is your Product Owner the only person who can make changes to the Product Backlog? Is your Development Team asking your Product Owner to write and order items all the items on the Product Backlog? Is the Product Owner the only person with write-access to a Product Backlog in a digital tool like Jira? Taken together, the theme here is that the Product Owner is the person who is responsible for maintaining the Product Backlog. In this post, we’ll show why this is a myth. You can read this line as reinforcing the idea the Product Owner should also do all these things. So, the Product Owner should write all the items on the Product Backlog. The Product Owner should order them. And the Product Owner should make the Product Backlog available to both the Scrum Team and stakeholders. 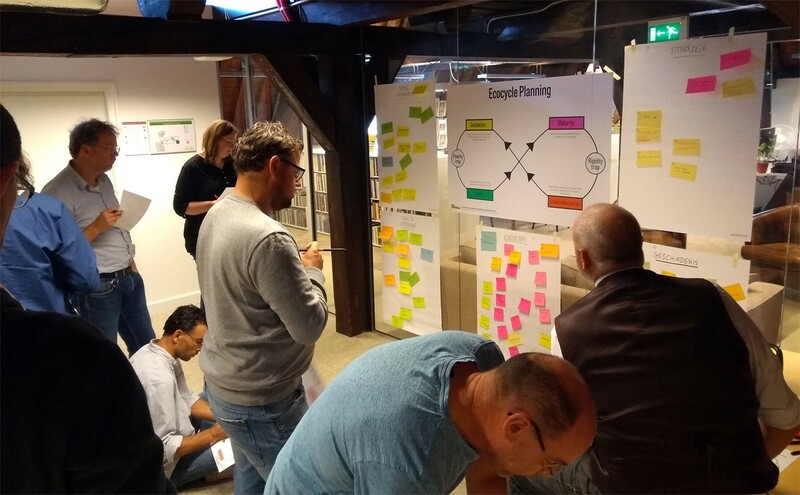 But the Scrum Guide then continues to describe that the Product Backlog is dynamic and constantly evolves in “an ongoing process in which the Product Owner and the Development Team collaborate on the details of Product Backlog items”. The keyword here is “responsible”. 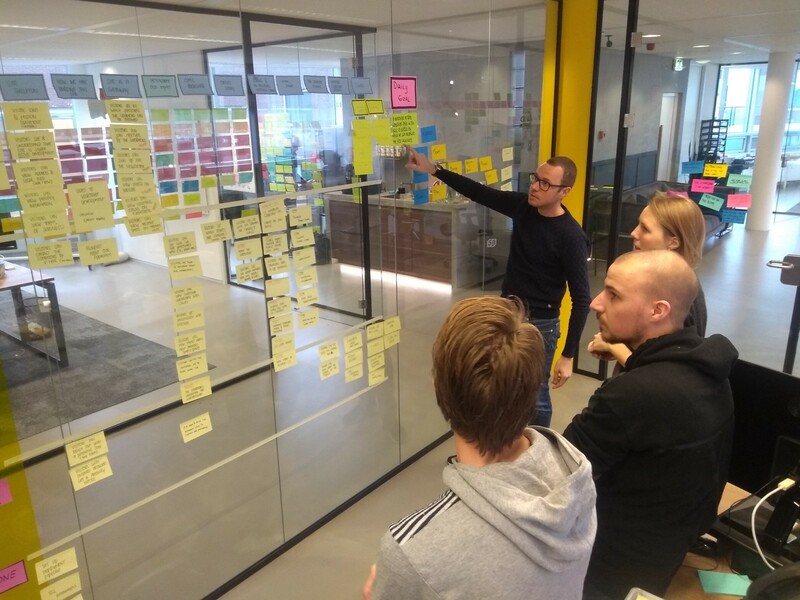 Ask yourself this; can a Product Owner maximize the value of work done by the Development Team if they are not involved in what goes on the Product Backlog and in what order? There are many different reasons for this myth to come into existence. One common cause is when Product Owners double as (business) analysts or come into the role from this background. From this perspective, it might seem sensible for them to take care of all of the ‘requirements analysis’ that is required to populate a Product Backlog. Often, Development Teams encourage this so they can focus on what they assume is their most important task: write code. But this is not how the roles are intended. Another common cause is the interpretation of ‘Scrum as a methodology’. Organizations eagerly turn Scrum roles into formal job descriptions. When Scrum is completely new to them, they try to understand new roles from traditional perspectives: Product Owners are responsible for requirements (analysts), Scrum Masters are responsible for the team (team leads or team managers) and developers are responsible for writing code (coders). But by doing so, they fail to understand the purpose behind the Scrum Framework. They don’t understand why we are doing all of this in the first place. So let’s return to the roots so we can understand. To better understand why this is a myth, we have to return to the essentials. The Scrum Framework exists to decrease the risks inherent to product development and other complex work. Far more often than not, product development is complex work where more is unknown than known. Because of this, we need close collaboration between professionals and the involvement of many minds to make sense of what is happening and identify next steps. In complex work, hierarchy only gets in the way of creativity, motivation and the intelligence of teams. From this perspective, it makes no sense to treat the Product Owner as the only person who can create items for the Product Backlog and order them. By treating the Product Owner like this, we are introducing hierarchical thinking into a framework that is fundamentally antithetical to it. And this goes both ways. Product Owners should work closely with their Development Team to create items for the Product Backlog and order them to maximize the value of work done by them. Development Teams, on the other hand, should proactively seek this out as well by offering suggestions for both items on the Product Backlog as their ordering. They should actively work with Product Owners to refine and clarify items, making sure they are understood both by the Scrum Team as by stakeholders. Scrum Masters, in turn, should help both the Product Owner and the Development Team understand that this is the most effective way to collaborate in complex work. In fact, it is perfectly fine for Development Team to be even more proactive and put items on the Product Backlog or re-order them if the Product Owner believes that this is the best way to maximize the value of their work. But ultimately, the Product Owner remains responsible for what goes on the Product Backlog and in what order — they have the final say. The Product Owner is the person you should go to when this isn’t the case. A couple of Scrum Teams (more in the back) working together to formulate product strategies and clean up their Product Backlogs together. A bit closer to home, here Barry Overeem is acting as Product Owner for our website & online marketing. The Product Backlog is fully transparent and was populated throughout development mostly by the Development Team itself, while the Product Owner kept the focus on what was important in terms of value. This myth strongly underscores that Scrum is far more than a bunch of roles, rules, and events. When we run into myths like this, it helps to go back to what it is we are trying to achieve with Scrum and interpret it from that perspective. The Product Owner ensures that there is a Product Backlog, that it is ordered and that it is made available to both the Scrum Team and stakeholders. This is the person you go to when this is not the case. But this doesn’t mean that the Product Owner is the only person in the Scrum Team who does this. In order to maximize the work done by the Development Team in each Sprint, it makes sense for the Product Owner to actively work with the Development Team to write items, refine and order them. In complex work, it’s all about effective collaboration between professionals. Want to separate Scrum from the myths? Join our Professional Scrum Master or Professional Scrum Master II courses (in Dutch or English). We guarantee a unique, eye-opening experience that is 100% free of PowerPoint, highly interactive and serious-but-fun. Or check out the previous episodes here.